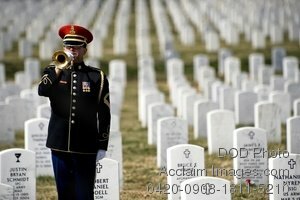 Description: Free, public domain image: Army Bugler Playing Taps in Front of Headstones at Arlington National Cemetery. A lone U.S. Army bugler plays Taps at the conclusion of the First Annual Remembrance Ceremony in Dedication to Fallen Military Medical Personnel at Arlington National Cemetery, March 11, 2009. (DoD photo by Mass Communication Specialist 1st Class Chad J. McNeeley.